Preheat oven to 180 degree celcius. Grease and flour or line the bottom of two 6 " roundbaking pans and one oven safe glass bowl / stainless bowl with parchment paper and keep it aside. Sift together flour and salt into a bowl and keep it aside. In a large mixing bowl or in the bowl of an electric mixer, add the butter, oil, sugar and vanilla essence and beat at medium speed until well blended. Beat in eggs, one at a time. With mixer on low, add rose pink icing food coloring. Then add one third of the flour mixture alternating with half of the butter milk. Beat in another third of flour mixture, then second half of butter milk. End with the remaining flour and beat until just combined. Divide half of the batter evenly between the 2 prepared pans and the bowl, sprinkle the chocolate chips and then top each evenly with remaining batter. Remove cakes from the oven and allow to cool in its pan for about 10 minutes then remove from the pans and let them cool completely on a wire rack..
Divide the frosting into 2 bowls. 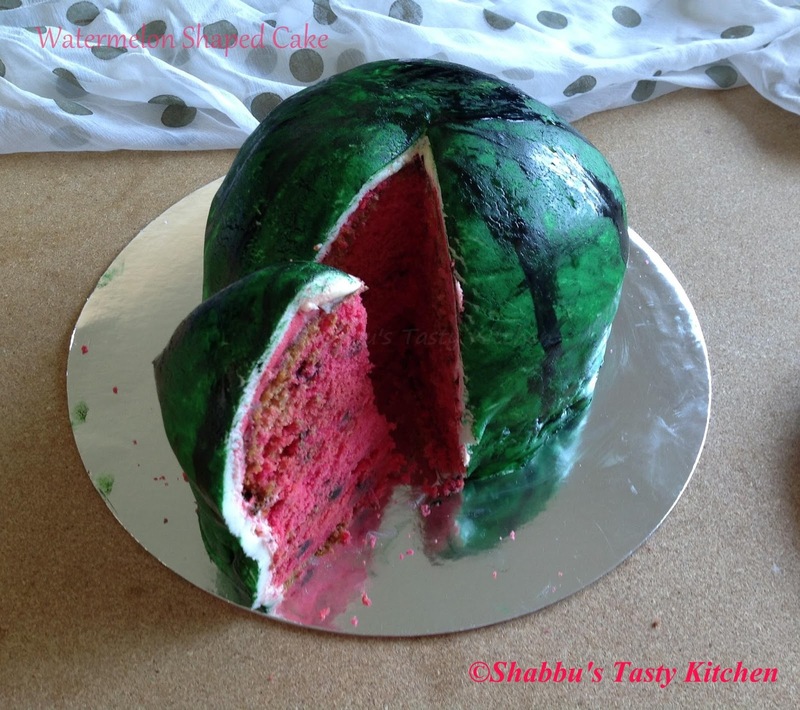 Keep one of these bowls aside for later and colour the other bowl with wilton red red icing colour until it matches with watermelon pink. Level the top of 2 round cakes. In a serving plate/ cake board, place the first round cake and spread a layer of pink buttercream on top , then sprinkle chocolate chips on top of that. 2. Then repeat this with the other round cake and finish off by topping 2 filled round cakes with bowl cake. 3. The next step is to carefully carve away just outer crust of the stacked cakes, keeping the dome shape intact. 4. Take the reserved white buttercream frosting that set aside and then frost the outside of the entire cake with a thin layer of frosting (crumb coat). 5. Place this crumb coated cake in the fridge for about 30 minutes to firm up the frosting. 6.Then ice the entire cake with remaining white buttercream as smoothly as possible and place in the fridge for about 1 hour to firm it up. 7. 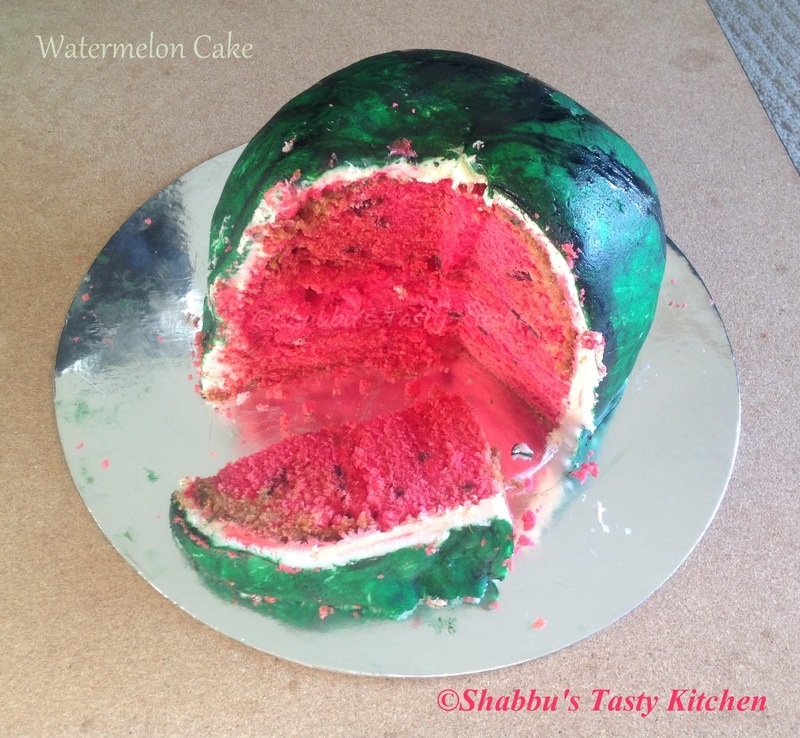 To create the white rind of watermelon, roll out about 2 lb of white fondant and then cover the cake. 9. Then paint the rind using a clean round tip paint brush by mixing wilton moss green, wilton kelly green and yellow and then make stripe-like watermelon patterns. (Paint the cake in stages, letting it rest for about half an hour in between). 10.Let the cake completely dry before cutting. Cut them into slices and then serve.. Fill popsicle moulds halfway with this mango puree and freeze it for 1 hour. Heat 2 tsp oil in a pan and add the cleaned chicken pieces and sprinkle little salt and roast the chicken till slightly brown on outside. Remove the chicken along with its any cooked juices and keep it aside. Heat 3 tsp oil in a pan and add cumin seeds, cinnamon, cardamom, cloves and bay leaves and fry well. Add the finely chopped onion and a pinch of salt and cook till soft. Add the ginger-garlic paste and saute till the raw smell disappears. Add the chilli powder, coriander powder and garam masala and saute for a minute. Then add 1 1/2 cup of water and allow to simmer the gravy till the oil separates on top. Add the browned chicken along with its juices and mix well and cook covered till the chicken is cooked well. Now open the lid and allow the water to slightly evaporate and cook for 2 minutes. Then add the yoghurt, mix well and switch off the flame. 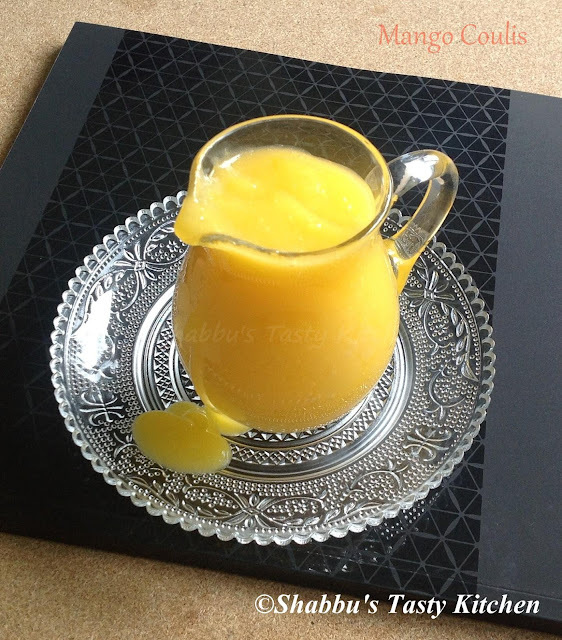 In a blender, add chopped mango, tender coconut pulp, chilled milk and sugar and blend well until smooth. In a bowl, sift together flour and salt and keep it aside. In a large bowl or in the bowl of electric mixer, add butter and icing sugar and beat on medium high speed until creamy. Add the egg yolk and beat again until the yolk combines well. Add the curd/ sour cream and vanilla essence and beat again until combined. Add the flour mixture and beat on low speed until flour has been incorporated. Do not over beat. Preheat the oven to 180 degree celcius. Line a baking sheet with baking paper/ parchment paper. Divide the dough into 2 parts and further divide one of the part into 4 equal sized portions. Add drops of different shades of food gels/ colorings into each of the 4 equal portions and knead the dough well. Roll the uncolored portion of the dough into a rectangle of 2 mm thickness on a lightly floured surface. (or roll it placing between two sheets of parchment paper). 10. Take small piece of dough out of each colored dough and roll each separately on a lightly floured surface into 4-5 inches long rope/ strip and diameter of about 0.5 cm. 11. Place each colored rope in one corner of the uncolored rolled rectangle and carefully turn it over to cover the colored rope completely and cut it exactly where it just covers as shown in below..
12. Roll up carefully and smooth it out using your fingers and seal the edges that are open. Repeat the same with the remaining colored ropes and rectangle dough. 13. Place them carefully on the prepared baking sheet and bake in the preheated oven for 15-20 minutes. 14. Cool for 5 minutes on baking sheet and then transfer to cooling racks to cool completely. 15. Once completely cool, use a knife to gently "sharpen" the cookies to make them look like colored pencils..Enjoy ! Wash and chop the long beans into small pieces. Heat oil in a pan and splutter mustard seeds. Add dry red chillies, curry leaves and crushed garlic and fry. Add chopped onion and saute till transparent. Add green chillies, chopped tomato and chopped payar and mix well. Add turmeric powder and salt, mix well and cook covered at low flame till done. (Sprinkle little water if required). Wash and finely chop the spinach. Boil the potatoes, peel off the skin and mash them well and keep it aside. Heat oil in a pan and splutter cumin seeds. Add finely chopped onion and saute well till transparent. Add chopped ginger, green chillies and salt and saute for a minute. Add the chopped spinach to this, mix well and fry till the leaves are cooked and all the water dries up. Add turmeric powder and garam masala and mix well. Add mashed potatoes and chopped coriander leaves, mix well for 2 minutes on low flame and switch off the flame. Once the mixture has cooled off a bit, make small balls and flatten into desired shapes. Clean the chicken pieces and marinate it with 1 tbsp chilli powder, 1 tsp turmeric powder, 2 tsp crushed ginger-garlic and salt and keep it aside for an hour. Heat 3-4 tbsp oil in a pan and fry the marinated chicken pieces till done and keep it aside. 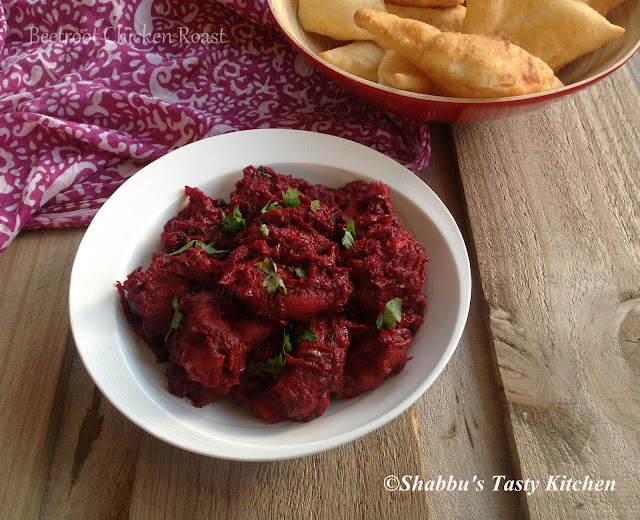 Grind together grated beetroot, tomatoes and 3 green chillies to a fine paste. Heat 4-5 tbsp oil in a pan and fry the sliced onion till golden brown and keep it aside. In the same pan, add 1 tbsp crushed ginger-garlic and 2 green chillies and saute for few seconds. Add 1 tbsp chilli powder and 1/2 tsp turmeric powder to this and saute till the raw smell disappear, over low flame. Then add the ground beetroot-tomato paste, 1 1/2 cup water and enough salt to this and bring to boil. Cook it for 5-6 minutes over low flame. Add the fried chicken pieces and cook for about 6-8 minutes till the gravy is thick. Add the fried onion, chopped capsicum, garam masala and coriander leaves and cook for another 2 minutes. In a bowl, add the gram flour, rice flour, chilli powder, cumin seeds, sesame seeds, asafoetida and salt and mix well. Then add water little by little and knead it to make a smooth dough. Fry the curry leaves in the same oil and garnish the fried murukku. Chop vazhakoombu and cabbage into fine pieces and keep it aside. 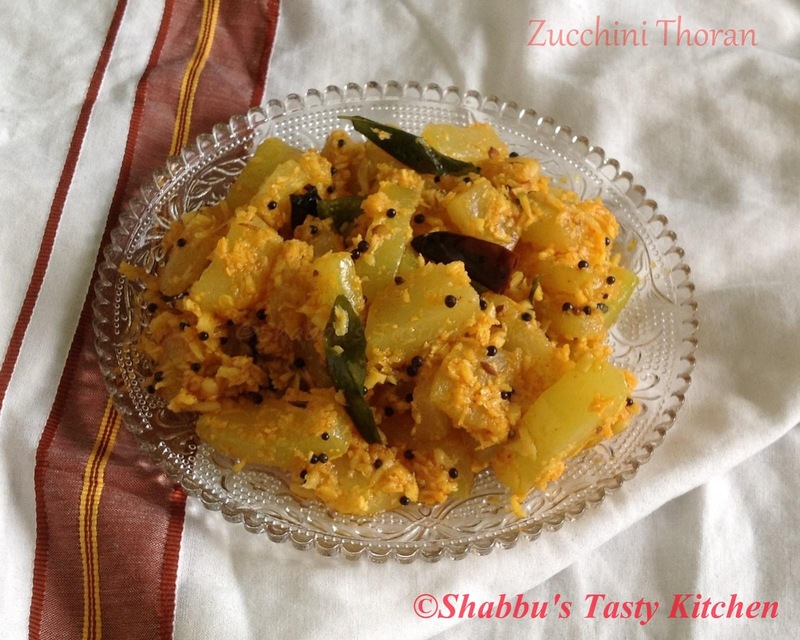 Crush grated coconut, cumin seeds, chilli powder, turmeric powder, green chilly and garlic together and keep it aside. Heat oil in a pan and splutter mustard seeds. Add urad dal and dry red chillies. Add chopped vazhakoombu and cabbage and mix well. Add salt, mix well and cook it covered for 4-5 minutes on low flame. Then add crushed coconut mixture, mix well and cook covered on low flame for 2-3 minutes. Clean the mussels and to this add chilli powder, turmeric powder, coriander powder, ginger-garlic paste and salt and mix well. In a bowl, add the egg, cornflour and rice flour and mix well and keep it aside. Dip each marinated mussel in this egg mixture and then roll in bread crumbs till well coated on all sides. Heat oil in a pan and fry them on medium flame till golden brown on both sides. Remove from the oil and drain them on a paper towel. Fry the curry leaves in the same oil and garnish the fried mussels.. Serve hot.. Prepare idiyappams and shred/ break it into small pieces and keep it aside. Heat oil in a pan and add cloves ,cinnamon and ginger-garlic paste and saute for a minute. Add finely chopped onion and saute till it turns transparent. Add grated carrots and cook covered in low flame for 2 minutes. Add finely chopped capsicums and celery and saute well. Add pepper powder, turmeric powder, garam masala and required salt and mix well. Then add the egg and scramble it well. Add soy sauce to this and mix well. Now add the idiyappam pieces and mix well until the masala coats the idiyappam evenly. Garnish with coriander leaves and switch off the flame..Serve hot / warm..
You can also use instant idiyappams, cook it as per the instructions given in the package.. In a pan, cook the drumsticks adding little turmeric powder, salt and enough water and keep it aside. Heat oil in a pan and splutter mustard seeds. Add sliced ginger and garlic and saute for 30 seconds. Add sliced onion and curry leaves and saute well till onion turns transparent. Add thinly sliced brinjal and salt and saute well for 2-3 minutes. Add turmeric powder and chopped tomato and mix well. Add crushed chilli and coriander powder to this and mix well till tomato turns soft. Now add the cooked drumstick along with its water and and cook till all the water dries up and the masala is well coated with the vegetables. In a blender, add the chopped mangoes with the icing sugar and water. Blitz it for 20 seconds until smooth, then add the lemon juice. Adjust the sweetness with more icing sugar if required and then strain through a sieve. 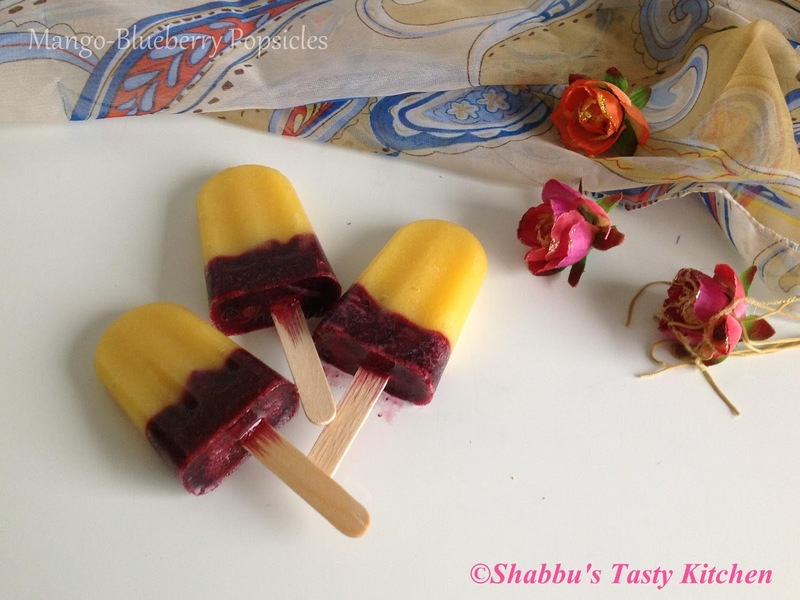 Serve with fruit tarts/ puddings or pour over ice creams/ sorbets.. In a large bowl, add the all purpose flour, yeast, sugar and salt and mix well using hands. Heat the water and milk together and bring it to lukewarm. Pour this milk into the flour mixture and knead well until well combined. Add the beaten egg to this and knead well. If the dough is sticky, add a little flour at a time and knead until the dough does not stick to the bowl. Then add butter and continue kneading for 12-15 minutes. 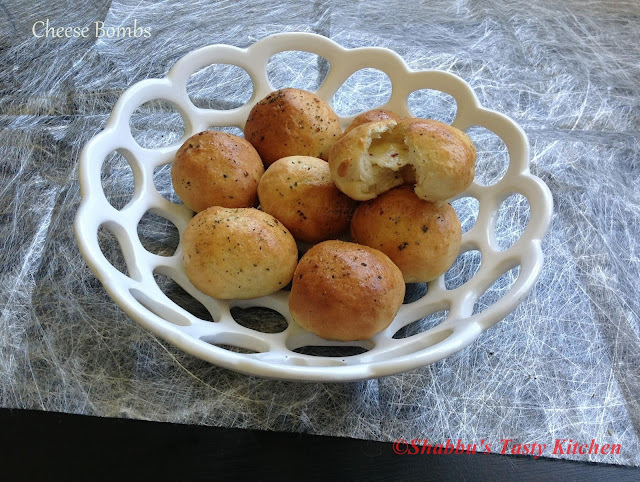 Bring the dough together as a ball. Oil a bowl and coat the dough all over with oil in the bowl and keep covered using a damp cloth in a warm place for about 45 minutes to 1 hour. This will be the first proving. Preheat the oven to 200 degree celcius. Line up a baking tray with butter paper or silicon mat and brush some oil on top of it. In a small bowl. mix the olive oil and the mixed spices with a pinch of salt and keep it aside. The dough will be doubled in volume after first proving. Punch the dough and release the air and knead it lightly. Take a lemon sized ball of the dough, flatten it gently using your fingers. Place a cube of cheese on top of the flattened dough and add a pinch of chilly flakes. Bring all the sides of the dough to the top and pinch it well to secure it firmly. Turn it upside down and roll it gently to even out the shape. Then place the finished ball in the prepared baking tray and repeat the steps to the remaining dough. Place all the balls with about 2-3 inches of space apart and cover it with a damp cloth and leave it to rest in a warm place for 15 minutes. Do not let for long. This is second proving. Brush with some egg/ milk wash on top and bake in the preheated oven for 15 minutes. Take it out after 10 minutes of baking and brush the spiced oil all over the top and then continue baking for the last 5 minutes. Eggless substitute - Add 1 tbsp of milk powder along with the flour and increase the quantity of milk by 1 tbsp. Heat oil in a deep large pan and add the popcorn kernels in the oil on low-medium heat. Cover the pan with a tight-fitting lid and allow it to pop. Transfer the popcorn to a large heat proof bowl, discarding any unpopped kernels. Line a tray with baking paper and keep it aside. To prepare caramel, combine butter, sugar, golden syrup/ honey and vanilla essence in a saucepan over low-medium heat. Stir without boiling, until sugar has dissolved and the mixture is smooth for about 5-7 minutes. Bring mixture to the boil and cook without stirring for about 5 minutes or until light golden at low flame and remove from the flame. Pour this caramel over the popcorn and stir with a spatula until popcorn is evenly coated with the caramel. Spread on the prepared tray and allow to cool completely then store in an airtight container...Enjoy ! 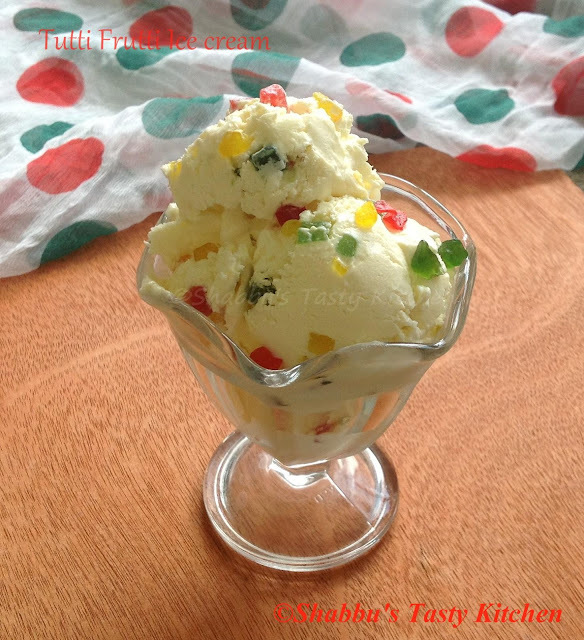 Then add the tutti frutti and mix well with a spatula. Heat 1 tbsp oil in a pan and add chopped garlic, ginger and green chillies and saute for a minute. Add 10 sliced shallots to this and saute for 2 minutes. Add chopped onion and saute well till transparent. Add cubed potatoes and mix well for a minute. Add turmeric powder and cleaned prawns and mix well. Add crushed pepper, coriander powder, kashmiri chilli powder and salt and mix well. Add garam masala to this and mix well. Add in the chopped tomatoes. Then add thin coconut milk, mix well and transfer this to a pressure cooker and cook for 1 whistle. Once the pressure releases, open the cooker and add thick coconut milk and heat for 2 minutes. Remove from the flame and transfer to a serving dish. Heat 1 tbsp oil in a pan and splutter mustard seeds. Add 4 sliced shallots, dried red chillies and curry leaves and fry till brown. 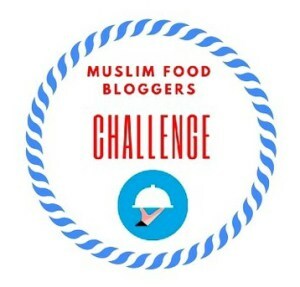 For Muslim Food Bloggers group challenge, this month's theme is " Biriyani". As we all know, Biriyani is one of the most popular and delicious rice dish. 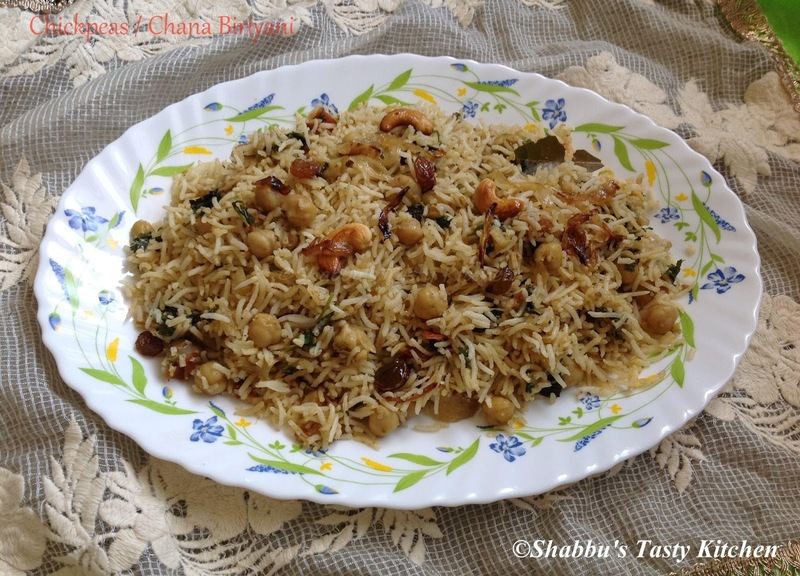 Even though meat based biriyanis are more common, I have chosen a vegetarian based biriyani using white chickpeas...For this biriyani, rice and masala are cooked separately and then layered and cooked on low flame (Dum). Soak the chickpeas/ chana in water for 8 hours. Wash and pressure cook it with a pinch of turmeric powder, 1"piece cinnamon, 1 cardamom and 2 cloves adding enough water and salt. Once the pressure releases, open the cooker and drain the water and reserve it to use while preparing masala. Grind ginger, garlic and green chillies together to a coarse paste and keep it aside. Heat 2 tbsp oil in a thick bottomed pan and add 3 cardamoms, 6 cloves, 2 piece cinnamon and 2 bay leaves and saute until nice aroma comes out. Add sliced onion and saute until it turns transparent. Add ginger-garlic-green chillies paste and saute well until onion turns light brown. Then add turmeric powder, chilli powder, coriander powder and 1 1/2 tsp garam masala and saute for few seconds until the raw smell disappears. Sprinkle little water, if required to prevent them from burning. Add chopped tomatoes and saute until they turn mushy and oil separates. Add the cooked chickpeas, coconut milk and 1/2 cup reserved water in which chickpeas is cooked and mix well. Cook for few minutes until the gravy thickens. Add the chopped coriander leaves and mint leaves and mix well. Check for salt and add if required and switch off the flame. Soak the rice in water for 30 minutes. Wash and drain the rice and keep it aside. Boil the water and keep it aside. Heat ghee in a thick bottomed pan, add cardamom, cinnamon, cloves and sliced onion and saute till transparent. Take a wide thick bottomed pan and rub it with little ghee and sprinkle little fried onions, cashew nuts, raisins and chopped coriander and mint leaves. Spread a layer of cooked rice and then add half of the prepared chana masala. Now add another layer of rice over masala, followed by the chana masala. Add the remaining rice as a top layer and sprinkle remaining fried onions, raisins, cashew nuts, 1/2 tsp garam masala and chopped coriander leaves on top. Cover the pan with an aluminium foil and close with a tight lid and cook on low flame for 15-20 minutes. In a bowl, add bulgur and little salt and pour boiling water over it, stir with a fork and keep it covered for 30 minutes. Then fluff the bulgur with a fork and keep it aside until room temperature. If there is excess water, drain it completely using a sieve. Transfer the bulgur to a large bowl and add finely chopped fresh parsley, spring onion greens, fresh mint, tomatoes, cucumber, olive oil, lemon juice, salt and freshly ground pepper and toss well until combined. In a blender, add strawberries, tender coconut pulp, chilled milk and sugar and blend well until smooth. Cut and clean the crab pieces and cook it with 1/2 tsp turmeric powder and salt adding enough water for about 10 minutes. Keep it aside. Heat a clay pot/ manchatty and add oil. Add fenugreek seeds, garlic, ginger, curry leaves and coconut slices / thengakothu and saute for 2 minutes at medium flame. Add sliced onions and green chillies and saute well adding little salt. Add 1/2 tsp turmeric powder, coriander powder, chilli powder and 1 tsp crushed pepper and mix well for a minute. Add mango pieces to this, mix well and cook it for 1-2 minutes adding 1/4 cup of water. When it boils, add the cooked crab and mix well. Add sliced tomato, mix well and cook covered for 2-3 minutes. Then add the coconut milk and mix well till the masala is well coated with the crabs. Check for salt and add 1/4 tsp crushed pepper, 1 tsp coconut oil and curry leaves and mix well. In a bowl, add cleaned drumstick leaves, chopped onion, green chillies, ginger, chilli powder, turmeric powder, asafoetida, coriander leaves and salt and mix well. Heat oil in a pan, drop little batter using spoon or hand and fry till it turns golden brown in low- medium flame. Peel and mash the bananas with a fork and keep it aside (about 1 cup). Sift the flour, baking soda and salt into a medium bowl and keep it aside. Whisk the eggs and vanilla essence together in a bowl and keep it aside. In another large bowl or in the bowl of electric mixer, cream the butter and sugar until light and fluffy. Then gradually pour the egg mixture into the creamed butter and stir to mix until incorporated. Add in the flour mixture and mix with a rubber spatula/ wooden spoon until just incorporated. Fold in the walnuts and then transfer the batter into the prepared loaf pan. Bake in the preheated oven for about 50-55 minutes or until the toothpick inserted in the centre comes out clean. Grind grated coconut, shallots, garlic and cumin seeds together to a fine paste and keep it aside. Boil 2 cups of water with enough salt in a pan. Heat a pan and slightly roast the rice flour/ idiyappam podi on low medium flame. Add the ground coconut paste and black sesame seeds and mix well for 2-3 minutes. Add the boiling water little by little and mix well using a wooden spoon. Then transfer the dough on a flat surface and knead to make a smooth dough without lumps. 6. Apply little oil in your palm and divide the dough into small lemon sized balls and roll them using a rolling pin into small circles. 7. Now roll them between your index finger to make a cylinder shape and seal the ends by pressing them together (or roll around a greased rod or thin rolling pin and press the overlapping edges together). Arrange them on a plate..
8.Heat oil in a pan and deep fry them till golden colour on medium flame and drain them on a paper towel. Wash and chop strawberries into small pieces. Then puree it using a blender adding 1/2 cup of water until smooth. Strain the strawberry puree to a large bowl/ jug through a strainer and add sugar syrup, lemon juice and remaining cold water and stir well to combine. Add grated coconut, crushed garlic, turmeric powder and chilli powder and mix well for 2-3 minutes. You can also prepare this thoran without peeling the skin of zucchini. Heat oil in a thick bottomed pan and add sliced onions and fry till golden brown in batches and keep it aside. Reduce the flame and in the same pan, add cinnamon, cloves and cardamoms and fry for 30 seconds. Add chopped garlic and ginger and saute well till raw smell disappears. Then add finely chopped onions and saute well till golden brown. Add cleaned chicken pieces and saute for 5 minutes till all the water dries up. Add turmeric powder, chilli powder and salt and mix well. Add the crushed pepper and mix well. Now add 1 cup of water to this and cook covered till done. In the meantime, grind fried onions with yoghurt to a paste. Add this paste to the cooked chicken , mix well and boil for 5 minutes.